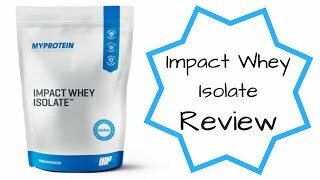 Fitness Savvy has been looking in detail at Myprotein Impact Whey Isolate. 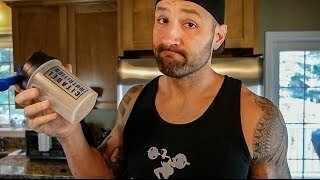 We discovered a staggering 2,551 online user reviews of this whey protein shake, which scored a respectable 90% (of 4.5 out of 5). Before we go any further, we thought we’d address one of the most common questions regarding this product. We found, while looking at 2,551 online user reviews, that Strawberry Cream was the best flavour, followed closely by Chocolate Smooth and then Salted Caramel. The worst flavour, in contrast, was Peanut Cookie, which appears to heave been discontinued – and rightly so! For allergens, see ingredients listed in bold. Made in a facility that also handles Egg, Gluten and products thereof. Apple & Raspberry Flavour: Whey Protein Isolate (Milk) (96%), Emulsifier (Soy Lecithin), Flavouring, Colour (Beetroot Red), Sweetener (Sucralose) Banana Flavour: Whey Protein Isolate (Milk) (96%), Emulsifier (Soy Lecithin), Flavouring, Colour (Curcumin), Sweetener (Sucralose) Banana Split Flavour: Whey Protein Isolate (Milk) (96%), Emulsifier (Soy Lecithin), Flavouring, Colour (Curcumin), Sweetener (Sucralose) Blackcurrant Flavour: Whey Protein Isolate (Milk) (96%), Emulsifier (Soy Lecithin), Flavouring, Colour (Beetroot Red), Sweetener (Sucralose) Blueberry Cheesecake Flavour: Whey Protein Isolate (Milk), Emulsifier (Soy Lecithin), Colour (Beetroot Red), Flavouring, Sweetener (Sucralose) Blueberry Flavour: Whey Protein Isolate (Milk) (96%), Emulsifier (Soy Lecithin), Natural Flavouring (Sulphites), Colour (Beetroot Red, Anthocyanin), Acid (Citric Acid), Sweetener (Sucralose) Chocolate Banana Flavour: Whey Protein Isolate (Milk) (91%), Emulsifier (Soy Lecithin), Cocoa Powder, Flavouring, Sweetener (Sucralose) Chocolate Brownie Flavour: Whey Protein Isolate (Milk), Emulsifier (Soy Lecithin), Fat Reduced Cocoa Powder, Flavouring, Sweetener (Sucralose) Chocolate Caramel Flavour: Whey Protein Isolate (Milk) (91%), Emulsifier (Soy Lecithin), Cocoa Powder, Flavouring, Sweetener (Sucralose) Chocolate Cereal Flavour: Whey Protein Isolate (Milk) (91%), Emulsifier (Soy Lecithin), Cocoa Powder, Flavouring, Sweetener (Sucralose). Chocolate Coconut Flavour: Whey Protein Isolate (Milk) (96%), Emulsifier (Soy Lecithin), Flavouring, Colour (E150c), Acidity Regulator (Malic Acid), Sweetener (Sucralose). Chocolate Cookies & Cream Flavour: Whey Protein Isolate (Milk) (91%), Emulsifier (Soy Lecithin), Cocoa Powder, Flavouring, Sweetener (Sucralose) Chocolate Orange Flavour: Whey Protein Isolate (Milk) (91%), Emulsifier (Soy Lecithin), Cocoa Powder, Flavouring, Sweetener (Sucralose) Chocolate Peanut Butter Flavour: Whey Protein Isolate (Milk) (91%), Emulsifier (Soy Lecithin), Cocoa Powder, Flavouring, Sweetener (Sucralose) Chocolate Smooth Flavour: Whey Protein Isolate (Milk) (91%), Emulsifier (Soy Lecithin), Cocoa Powder, Flavouring, Sweetener (Sucralose) Cinnamon Danish Flavour: Whey Protein Isolate (Milk), Emulsifier (Soy Lecithin), Colour (E150a), Flavouring, Sweetener (Sucralose) Cinnamon Roll Flavour: Whey Protein Isolate (Milk) (94%), Flavouring, Emulsifier (Soy Lecithin), Sweetener (Sucralose), Salt. Coffee Caramel Flavour: Whey Protein Isolate (Milk), Emulsifier (Soy Lecithin), Colour (E150a), Flavouring, Sweetener (Sucralose) Double Chocolate Flavour: Whey Protein Isolate (Milk) (91%), Emulsifier (Soy Lecithin), Cocoa Powder, Flavouring, Sweetener (Sucralose) Fruity Cereal Flavour: Whey Protein Isolate (Milk) (96%), Emulsifier (Soy Lecithin), Flavouring, Sweetener (Sucralose). Maple Pecan Flavour: Whey Protein Isolate (Milk) (96%), Emulsifier (Soy Lecithin), Flavouring, Colour (E150c), Sweetener (Sucralose) Natural Banana Flavour: Whey Protein Isolate (Milk) (96%), Emulsifier (Soy Lecithin), Natural Flavouring, Colour (Curcumin), Sweetener (Sucralose) Natural Banoffee Flavour: Whey Protein Isolate (Milk) (96%), Emulsifier (Soy Lecithin), Natural Flavouring, Malt Extract, Sweetener (Sucralose) Natural Chocolate Flavour: Whey Protein Isolate (Milk) (91%), Emulsifier (Soy Lecithin), Cocoa Powder, Natural Flavouring, Sweetener (Sucralose) Natural Strawberry Flavour: Whey Protein Isolate (Milk) (96%), Emulsifier (Soy Lecithin), Natural Flavouring, Colour (Beetroot Red), Sweetener (Sucralose) Natural Vanilla Flavour: Whey Protein Isolate (Milk) (96%), Emulsifier (Soy Lecithin), Natural Flavouring, Sweetener (Sucralose) Neapolitan Flavour: Whey Protein Isolate (Milk), Emulsifier (Soy Lecithin), Fat Reduced Cocoa Powder, Flavouring, Sweetener (Sucralose) Orange & Passion Fruit Flavour: Whey Protein Isolate (Milk) (96%), Emulsifier (Soy Lecithin), Flavouring, Colour (Carotenes), Sweetener (Sucralose) Orange Cream Flavour: Whey Protein Isolate (Milk) (96%), Emulsifier (Soy Lecithin), Flavouring, Colour (Carotenes), Sweetener (Sucralose). Peanut Cookie Flavour: Whey Protein Isolate (Milk), Emulsifier (Soy Lecithin), Colour (E150a), Flavouring, Sweetener (Sucralose) Pecan Pie Flavour: Whey Protein Isolate (Milk), Emulsifier (Soy Lecithin), Colour (E150a), Flavouring, Sweetener (Sucralose) Pineapple Flavour: Whey Protein Isolate (Milk) (96%), Emulsifier (Soy Lecithin), Flavouring, Colour (Curcumin), Sweetener (Sucralose) Raspberry Flavour: Whey Protein Isolate (Milk) (96%), Emulsifier (Soy Lecithin), Natural Flavouring, Colours (E162, E163), Sweetener (Sucralose) Rocky Road Flavour: Whey Protein Isolate (Milk) (96%), Emulsifier (Soy Lecithin), Cocoa Powder, Flavouring, Sweetener (Sucralose) Rum & Raisin Flavour: Whey Protein Isolate (Milk) (96%), Emulsifier (Soy Lecithin), Flavouring, Colour (E150c), Sweetener (Sucralose) Salted Caramel Flavour: Whey Protein Isolate (Milk) (96%), Emulsifier (Soy Lecithin), Flavouring, Colour (E150c), Sweetener (Sucralose) Stracciatella Flavour: Whey Protein Isolate (Milk) (91%), Emulsifier (Soy Lecithin), Cocoa Powder, Flavouring (Milk), Sweetener (Sucralose) Strawberry & Raspberry Flavour: Whey Protein Isolate (Milk) (96%), Emulsifier (Soy Lecithin), Flavouring, Colours (E162, E163), Sweetener (Sucralose) Strawberry Cream Flavour: Whey Protein Isolate (Milk) (96%), Emulsifier (Soy Lecithin), Flavouring, Colour (Beetroot Red), Sweetener (Sucralose) Tiramisu Flavour: Whey Protein Isolate (Milk) (91%), Emulsifier (Soy Lecithin), Cocoa Powder, Flavouring, Colour (E150c), Sweetener (Sucralose) Toffee Flavour: Whey Protein Isolate (Milk) (96%), Emulsifier (Soy Lecithin), Flavouring (Flavouring, Malt Powder (Barley),Sweetener (Sucralose)). 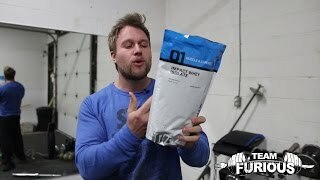 Unflavoured: Whey Protein Isolate (Milk) (100%), Emulsifier (Soy Lecithin) Vanilla Flavour: Whey Protein Isolate (Milk) (96%), Emulsifier (Soy Lecithin), Flavouring, Sweetener (Sucralose) White Chocolate Flavour: Whey Protein Isolate (Milk) (96%), Emulsifier (Soy Lecithin), Flavouring, Sweetener (Sucralose). Chocolate Mint Stevia Flavour: Whey Protein Isolate (Milk) (89%), Emulsifier (Soy Lecithin), Flavouring(Cocoa Powder, Natural Flavouring, Sweetener (Steviol Glycosides). Blueberry & Raspberry Stevia Flavour: Whey Protein Isolate (Milk)(89%), Emulsifier (Soy Lecithin), Flavouring(Natural Flavouring, Colours (Beetroot Red, Anthocyanin) Sweetener (Steviol Glycosides). Summer Fruits Flavour: Whey Protein Isolate (Milk)(94%), Emulsifier (Soy Lecithin), Flavouring(Flavouring, Acid(Citric Acid) ,Colours (Beetroot Red, Curcumin) Sweetener (Sucralose). Vanilla Raspberry Flavour: Whey Protein Isolate (Milk)(93%), Emulsifier (Soy Lecithin), Sweetener (Sucralose),Flavouring, Natural Flavouring.